Choco Lite was a very '70s candy bar. Like Aero, it was chocolate pocked with little holes and deliciously airy. But the wrapper was so earth-toned and the font was all bubbly. Jason Liebig has a Choco Lite sign and wrapper, and it really takes me back. I never found Nestle Aero to be quite the same, though they're not bad. 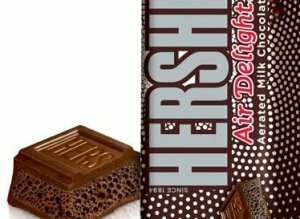 But then yesterday, Katherine found this and posted it on our Facebook page: Hershey's now has the Air Delight bar, which is also pocked full of holes and looks very similar. They even have Hershey's Kisses in this flavor now. My mom was hooked on ChocoLite in the 70s, and it was really the only candy we had lying around the house. Never seemed all that great to me. I ADORED Chocolite bars. I don't remember this brown wrapper...I remember something more colorful. I always used to get these down at Lawson's. I have tried the Aero bar and I don't care for it. I got really excited when I saw the Hershey AirDelight, but it isn't the same. I've never liked the Hershey chocolate flavor in general compared to Nestle, and the texture is not the same. Probably the omission of the tiny rice crisp chips is part of it, but it's more than that. I cannot for the life of me figure out why Nestle doesn't bring Chocolite back...so many of us miss it!